This Commercial Lease Agreement ("Lease") is made and effective ____________, 20__, by and between Commercial Entity, Inc. ("Landlord") and Commercial Entity Subsidiary, Inc., ("Tenant"). Landlord makes available for lease those portions of the Building designated as Suites ________________. (the "Leased Premises"). Landlord desires to lease the Leased Premises to Tenant, and Tenant desires to lease the Leased Premises from Landlord for the term, at the rental and upon the covenants, conditions, and provisions herein set forth. A. Landlord hereby leases the Leased Premises to Tenant, and Tenant hereby leases the same from Landlord, for an "Initial Term" beginning ___________, 20__ and ending __________, 20__. Landlord shall use its best efforts to give Tenant possession as nearly as possible at the beginning of the Lease term. If Landlord is unable to timely provide the Leased Premises, rent shall abate for the period of delay. Tenant shall l make no other claim against Landlord for any such delay. B. Tenant may renew the Lease for one extended term of Five Years. Tenant shall exercise such renewal option, if at all, by giving written notice to Landlord not less than ninety (90) days prior to the expiration of the Initial Term. The renewal term shall be at the rental set forth below and otherwise upon the same covenants, conditions and provisions as provided in this Lease. A. Tenant shall pay to Landlord during the Initial Term rental of _________________Dollars, ($____________) per year, payable in installments of _____________ Dollars ($___________) per month. Each installment payment shall be due in advance on the first day of each calendar month during the lease term to Landlord at __________________ , or at such other place designated by written notice from Landlord or Tenant. The rental payment amount for any partial calendar months included in the lease term shall be prorated on a daily basis. 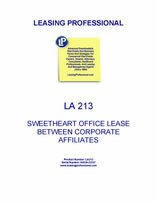 Tenant shall use the premises as and for general office space/warehouse space for all legitimate purposes connected with the business of automotive lease/finance operations.